You previously saw the pair I designed for Darrelle Revis’ Manager John Geiger, well here is the pair that was made for The Island himself. The details of this pair include deep forest green nubuck suede fabric, custom heel panel with #24 and “Revis Island” graphic, splattered effect on lining / heel / eyestay, restitched swooshes with painted contrast edges, dyed tongue piping, and a custom tongue tag. The tag mates #24 with the GourmetKickz logo and once again reads “Food for the Island”. 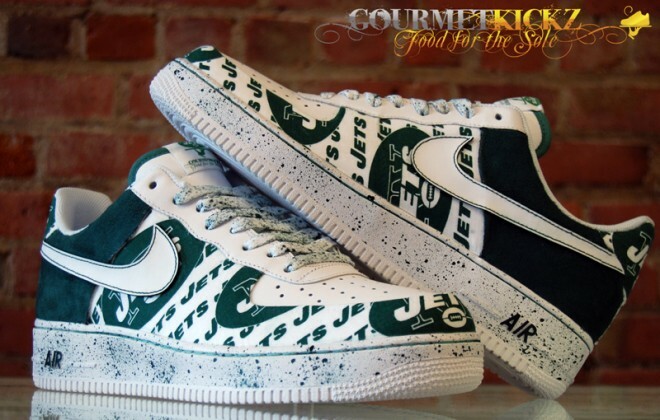 Darelle Revis will surely remain well fed on these GourmetKickz. See more images after the jump. I was recently commissioned to do something very special for John Geiger and Darrelle “The Island” Revis. The above pair were designed for John Geiger. The details include a Jets fabric application, deep forest green nubuck suede, a stippling effect to both the midsole and laces, restitched swooshes with painted contrast edges, JETS heel tab, and custom tongue tag. 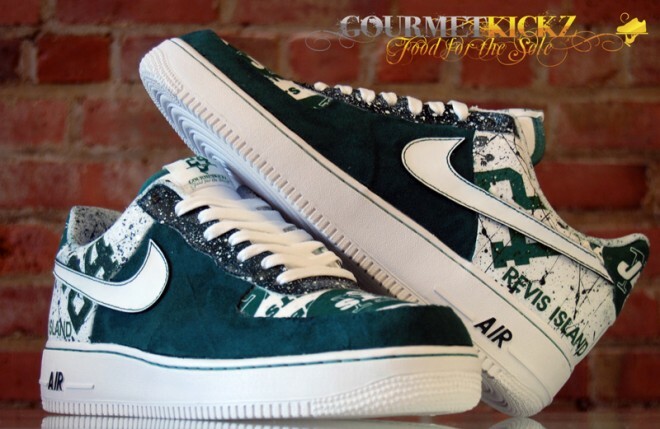 The tag has a modified GourmetKickz logo, mating the Jets and GK symbols, with a slogan that reads “Food for the Island” as opposed to the traditional “Food for the Sole” GourmetKickz slogan. More images after the jump. If you are any kind of Nike Foamposite fan then you are certainly aware that there is somewhat of a “foam fast” going on. Nike’s last foamposite release was the Pine Greens, and we diehard foamheads are asked to wait clear until February 2012 before copping our next pair! Well af1king.com understands the value of your time and the value of peace of mind in knowing you have your pair on reserve. 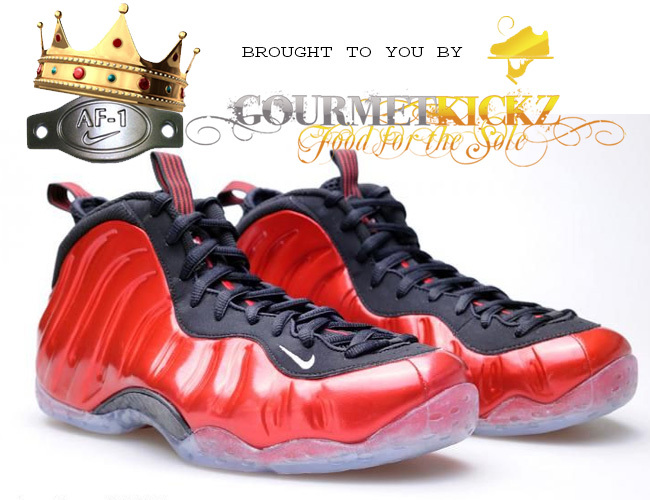 Hence the launch of this pre-order for the above pictured Nike Foamposite One Metallic Red. This shoe will not let anyone down by a long shot as the images reveal the vibrant metallic varsity red and amazing clear soles. This shoe, like most other foams, will certainly break necks. So if you value your time and want to rest at ease, stay home from the crowds and line-ups and just look for a friendly package in the mail from good ol’ Chef, you can head over to the AF1King Store by clicking here, or scroll down after the jump and pre-order your pair now.